This is quite the momentous year for me. After the wedding of my dreams, followed by a honeymoon that is by far the best vacation I ever took, my lil guy is about to embark on a new adventure. He will soon have his first day of Kindergarten later this week! It's hard to believe that he is growing up so fast, even more so as he eagerly awaits the opportunity to sport his new backpack, wear his new school clothes and meet new friends at his elementary school. Am I emotional about it? Not one bit. More than anything, I'm excited for him and how he will navigate through the school, soaking it all in. It's such an exciting time and I couldn't be more proud of what he's done to get to where he is and where he will be headed! That said, I'm also faced with new challenges in the kitchen as he starts off with a new routine and going to school for the first time. I'll need to hunker down on a routine of my own with breakfasts every morning, packed lunches, and scheduled dinner for the family. But in between it all, I'm also looking forward to making some fun and tasty snacks to welcome my lil guy (and husband!) home from their day. 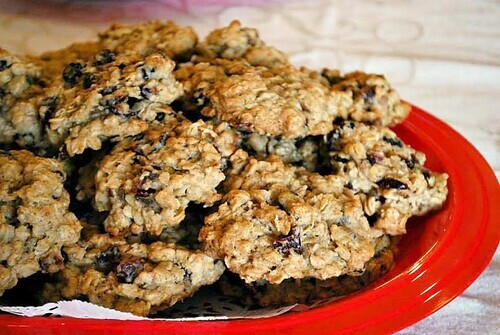 If you're looking for a great snack for your kiddies, may I suggest these Cranberry Orange Oatmeal Cookies? Thanks to my friends at Krusteaz, they have some new cookie mixes perfect for fall and they have saved me time and trouble so I can have some sweet goodies ready in no time! These Cranberry Orange Oatmeal Cookies use Krusteaz Brown Sugar Oatmeal cookie mix, fresh orange zest, orange extract, rolled oats and dried cranberries to make into a sweet cookie for our cuties to gobble up! You can get the full recipe here, on the Krusteaz website!